The announcement comes just hours after Democratic leadership publicly defended him. On Sunday, Rep. John Conyers (D-MI) announced his intention to step aside as the ranking committee member on the powerful House Judiciary Committee following a series of sexual harassment allegations leveled against him by several women on Capitol Hill. “After careful consideration and in light of the attention drawn by recent allegations made against me, I have notified the Democratic Leader of my request to step aside,” said Conyers in a written statement on Sunday. Conyers’ decision comes on the heels of a week in which key members of the Democratic caucus expressed their support for their colleague amidst calls for him to resign or otherwise face punishment. As recently as Sunday morning, House Minority Leader Nancy Pelosi (D-CA) appeared on Meet The Press and told host Chuck Todd that Conyers “is an icon in our country,” and deserving of due process before any decisions are made regarding his future. But she took a blunter approach to Conyers following news of his recusal from the committee. “Zero tolerance means consequences,” she said later in the day on Sunday. 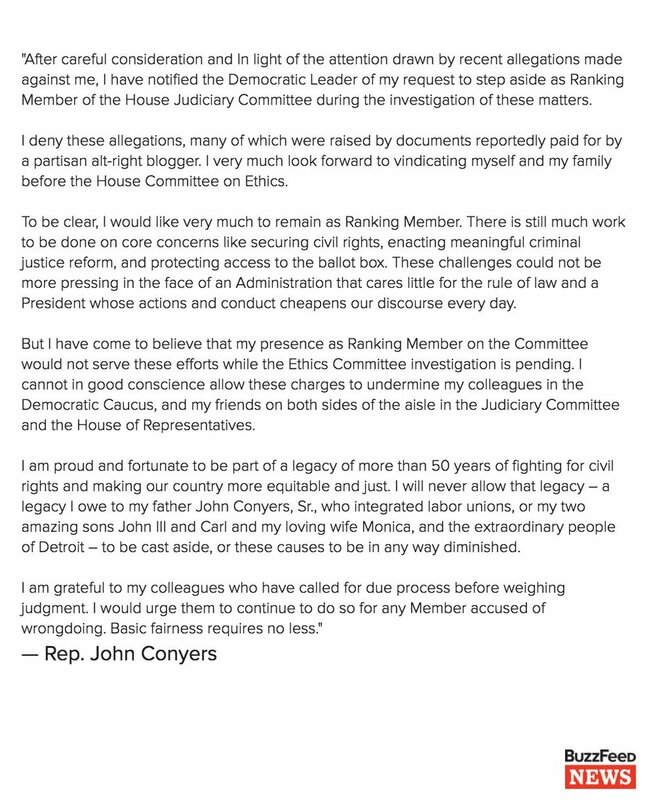 “I have asked for an ethics investigation, and as that investigation continues, Congressman Conyers has agreed to step aside as Ranking Member.” Rep. Jerrold Nadler, the second most senior Democratic member of committee, issued a statement as well. Conyers has repeatedly denied the allegations made against him, and continued to do so in his statement. “I very much look forward to vindicating myself and my family before the House Committee on Ethics,” he said, adding that his withdrawal from the Judiciary Committee is an effort to avoid any distraction away from the committee’s important work. Last week, Buzzfeed published a report detailing several allegations of sexual harassment made by former members of Rep. Conyers’ staff. One alleges she was fired after she rebuffed his advances.